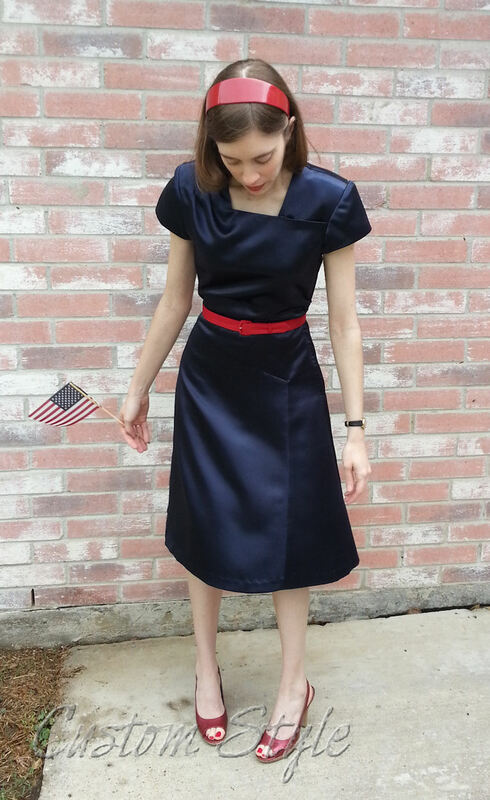 In honor of all the brave Americans who have died in service to our country to pay the high price of freedom, I wore my navy 1940s style dress to church yesterday. It’s perfectly patriotic and I wanted to get some detail shots for the blog that I didn’t get before. 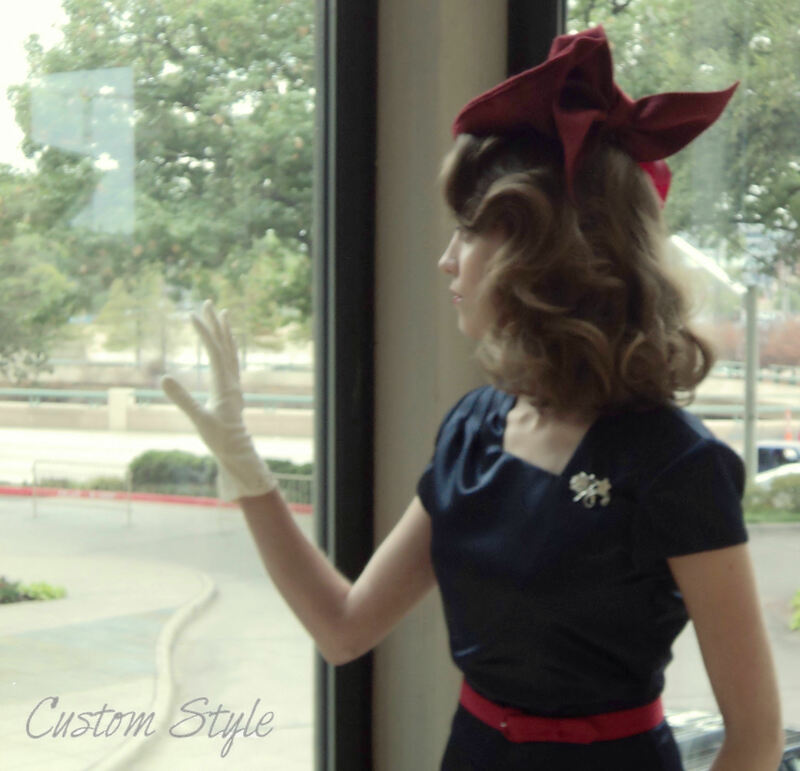 I decided to pair it with the same red heels and self-made fabric belt as I did the first time, but instead of the retro style felt hat, I wore a red headband. I’m surprised how much use I’ve gotten out of this dress that I originally made as a quick costume in the matter of a couple of day’s time. 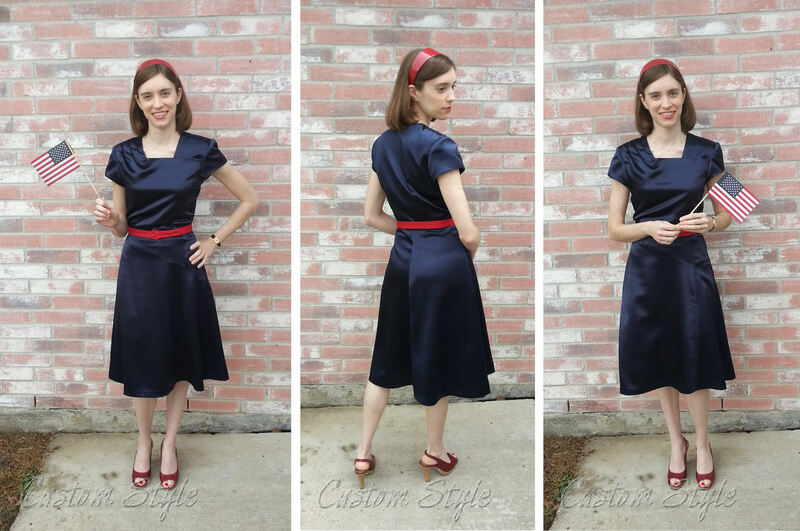 Nothing about its construction is really couture – I just stitched it up straight from Butterick 5281 and amazingly didn’t need any alterations! It would be simple to change the look with different accessories, yet I find myself wearing it most often with the red heels, belt, and headband. 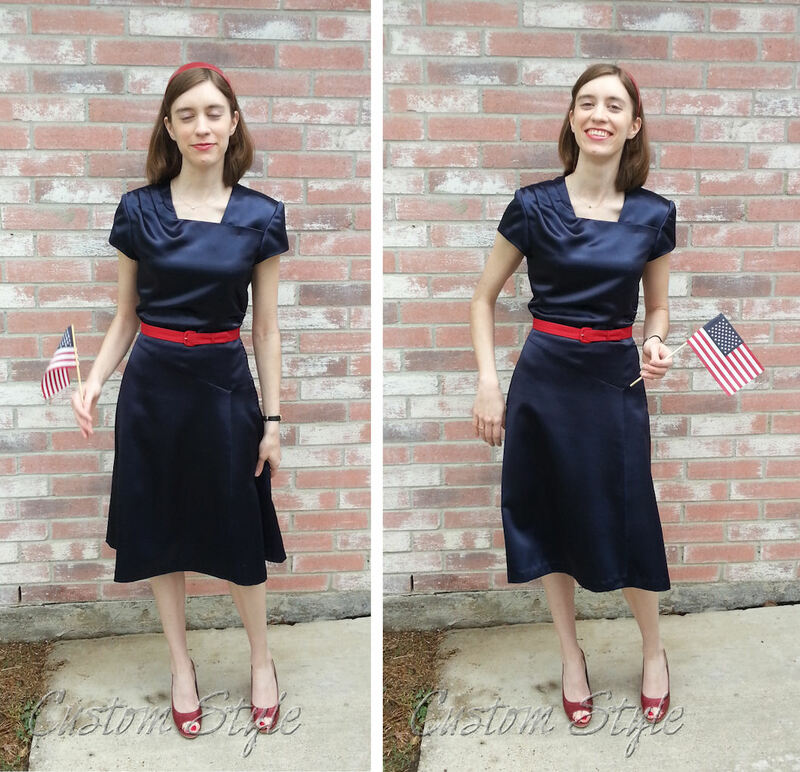 I love the navy & red combination because it is subtly patriotic yet easy to wear at anytime. So there’s how I make my retro dress work without being too costumey for modern day. May all my fellow Americans enjoy the day of grilling out and family time while remembering those who have sacrificed to make the holiday possible! And a big THANK YOU to all our men and women currently serving in the Armed Forces! 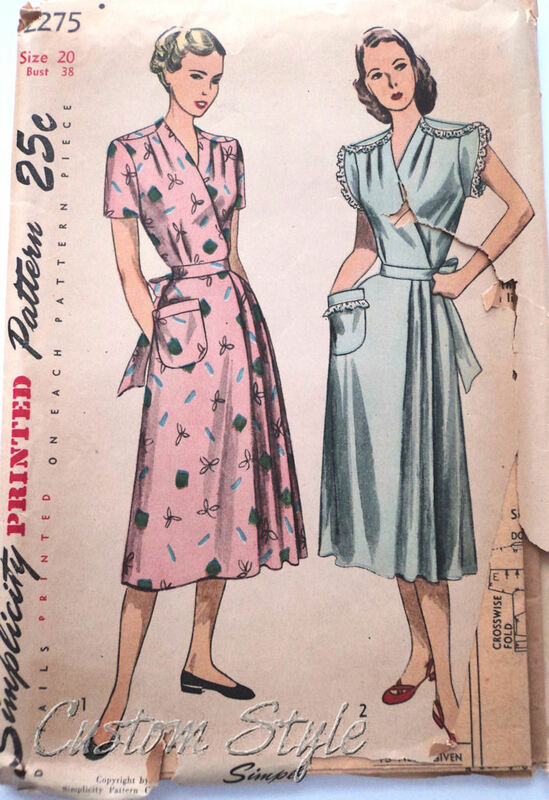 I have been going through & photographing my vintage patterns over the last few days in an attempt to date & organize them. I had not realized how many I actually have, and I had completely forgotten about some really great ones! I think I’ve only actually purchased 5 or 6 of the vintage ones I own. Many were gifted to me by my mother-in-law, and quite a number of them are ones I rescued from a “graveyard” box when I was working as a costumer along side Ken Weber (one of the owners of Vintage Martini) a few years ago. They were in the box because their envelopes weren’t in the best shape for selling, and he didn’t want to spend time examining them to see if all the pieces were included. 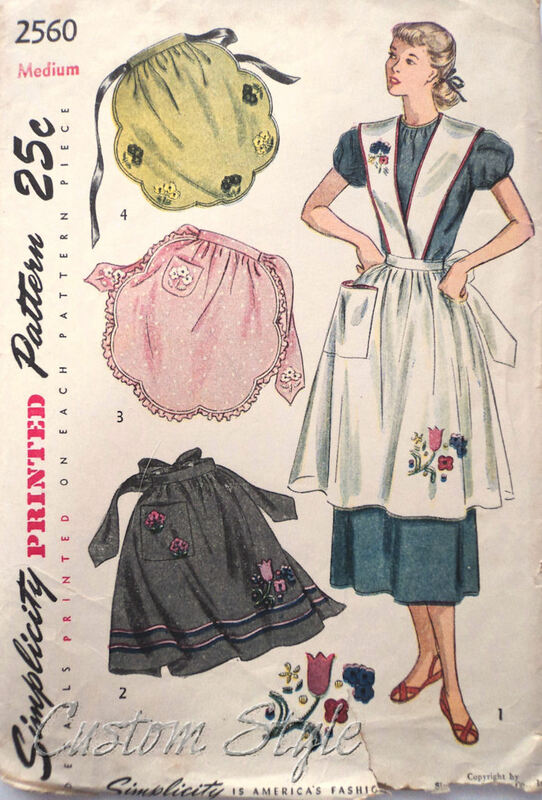 I’m not terribly picky about condition (I can usually draft the missing pieces as long as I have enough of the information included with the pattern), so I happily scooped up the most interesting ones. 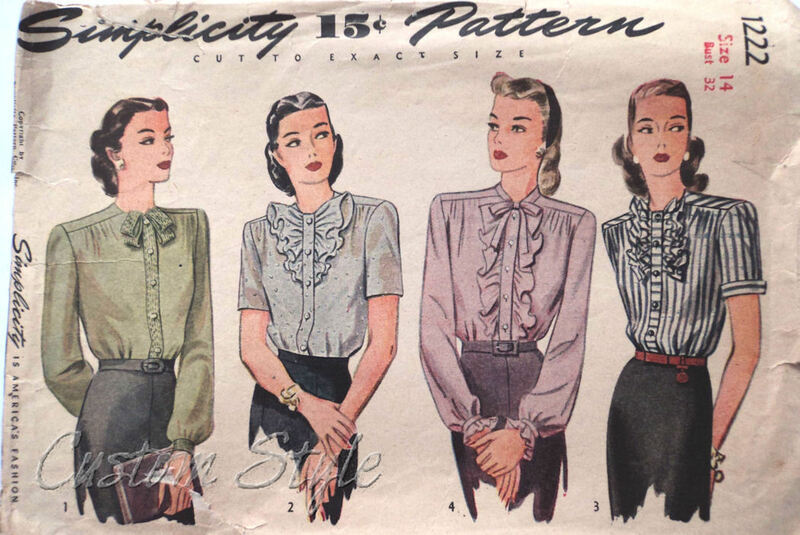 I’m not sure I really have the blouse pattern because the envelope is empty except for the instruction sheet. The pattern pieces may be hiding next to another pattern in a disintegrating envelope, but I haven’t done a thorough search yet. Even if I don’t have it, the envelope & instructions should be enough information for me to recreate it. 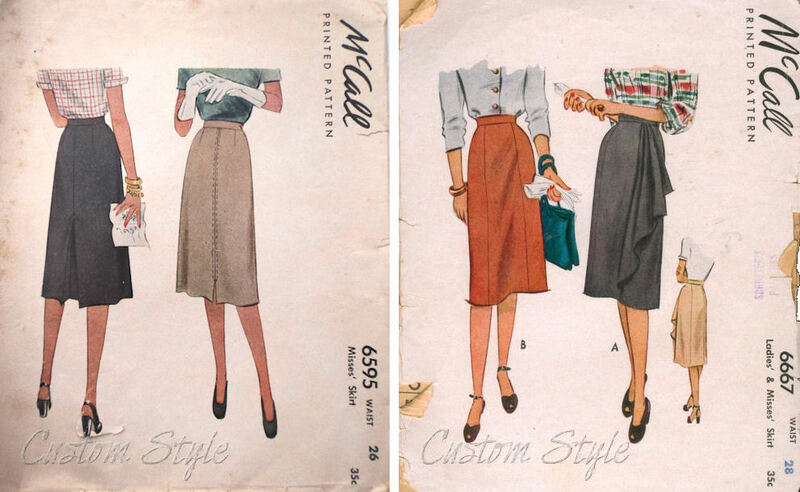 McCall 6595 and 6667 Skirt patterns – I love the drape on the one on the Right! It’s very “Salvation Army uniform” in red. I even have the original transfers included! 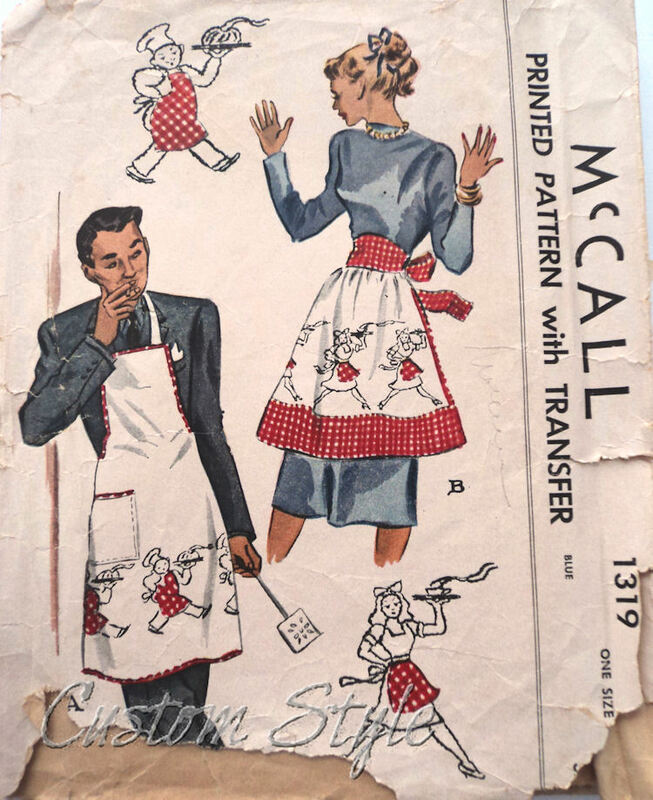 Of all the vintage patterns from this decade, this one is my favorite. I definitely need to make one, even if it’s for someone else! 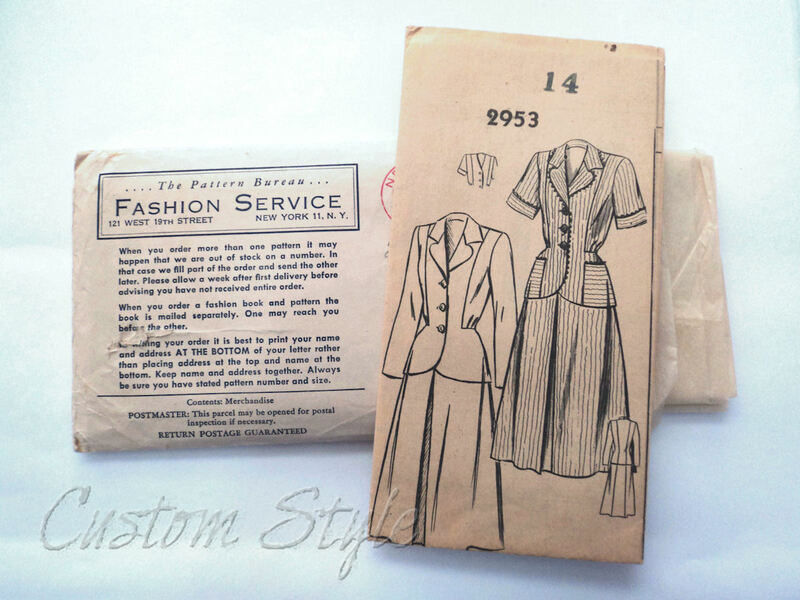 Mail Order pattern 2953 Women’s suit – ca. 1940s? I wish the sketch showed a person wearing it so I could see a hairstyle to help date it! 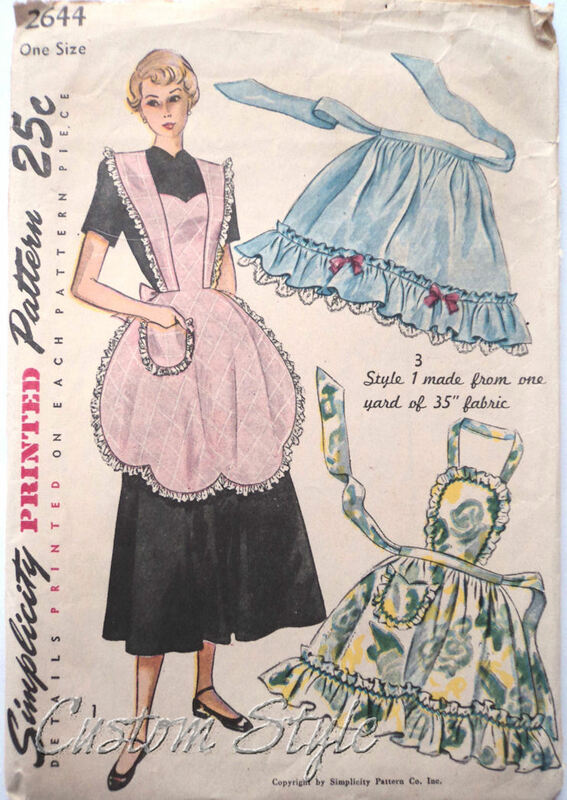 Vintage Patterns Wiki was very helpful in my search for pattern dates. Even if the date wasn’t listed on the site’s page for a pattern, there was often a useful link that took me to the information I needed. 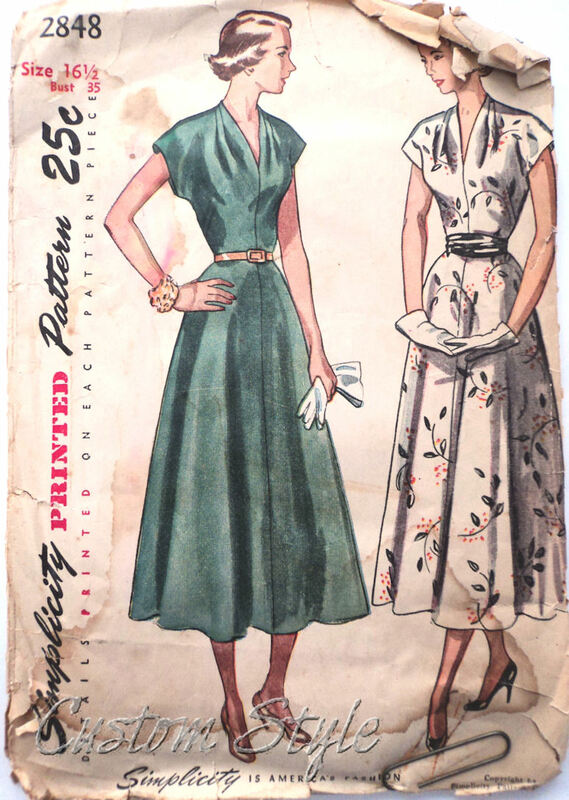 Unsurprisingly, I also have quite a few vintage patterns from both the 1950s & 1960s (it’s safe to say those are my favorite decades in fashion), and a couple from the 1970s. Today the mailman rang my doorbell and left a package on my doorstep. It was from my Mother-in-law, and it was rather heavy. 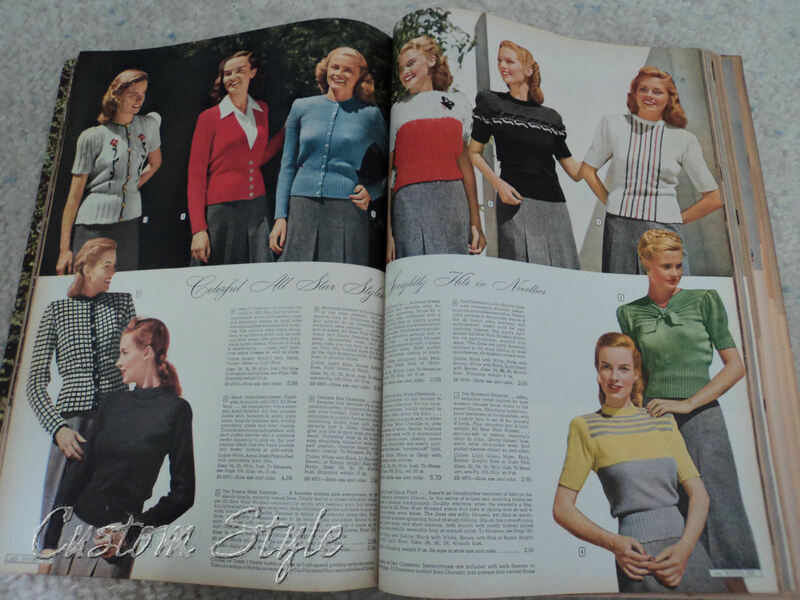 The Montgomery Ward Catalog for Fall & Winter of 1946-1947! It’s a full inch-and-a-half thick! Over 1000 pages of detailed history, and it’s BIG – 9.25” x 13.25” sized pages! It includes everything from clothing to refrigerators to children’s toys to tractor parts. It’s so thick the index fits on the spine! Of course my favorite section is the women’s fashion. 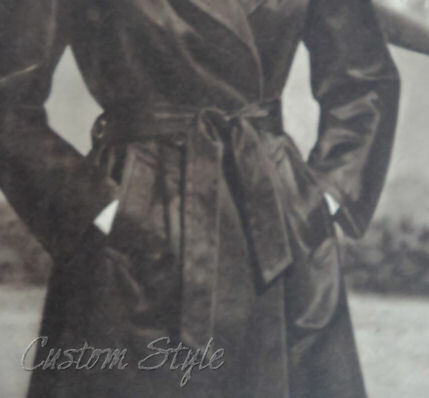 I find it interesting that the styles of jackets and coats back then aren’t terribly different from the modern styles in stores today. 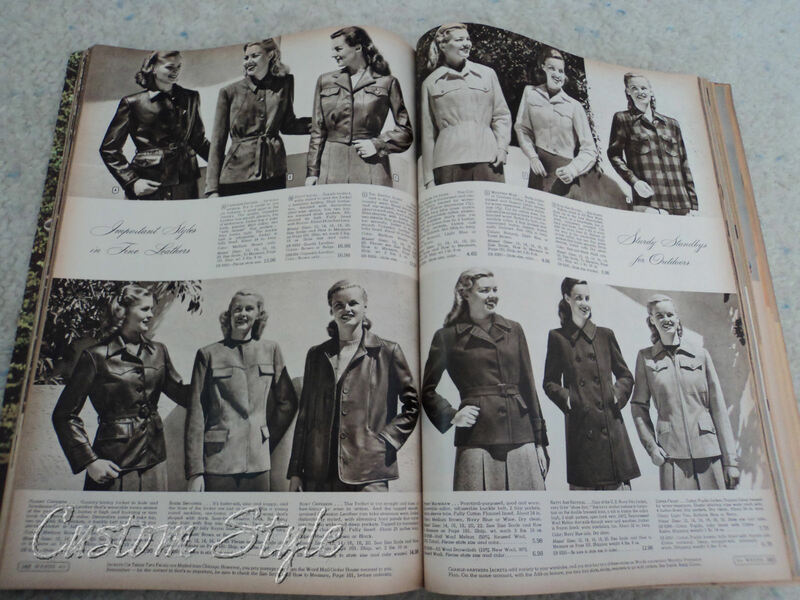 I especially like the wool pea coat on the bottom row, middle right page. 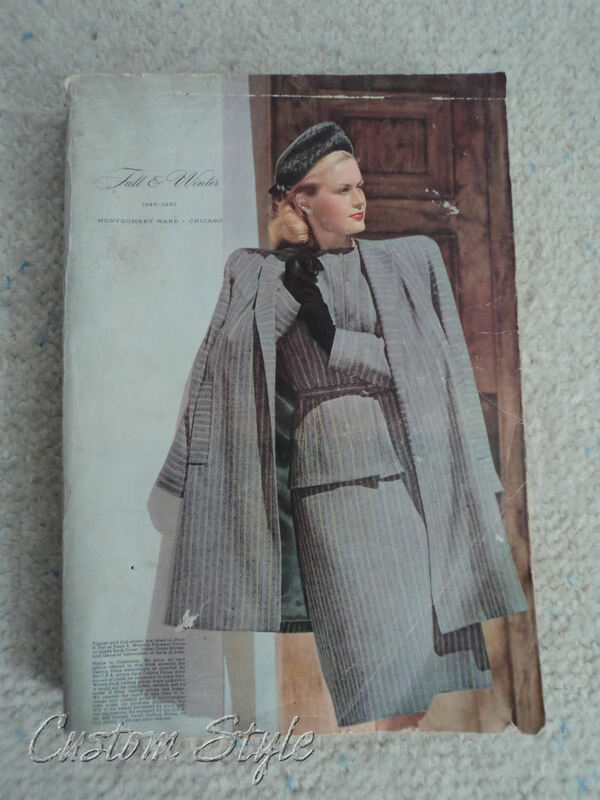 Other than the elaborate Forties hairstyles and the fact that none of the models are wearing jeans, it’s kind of hard to date the coats. 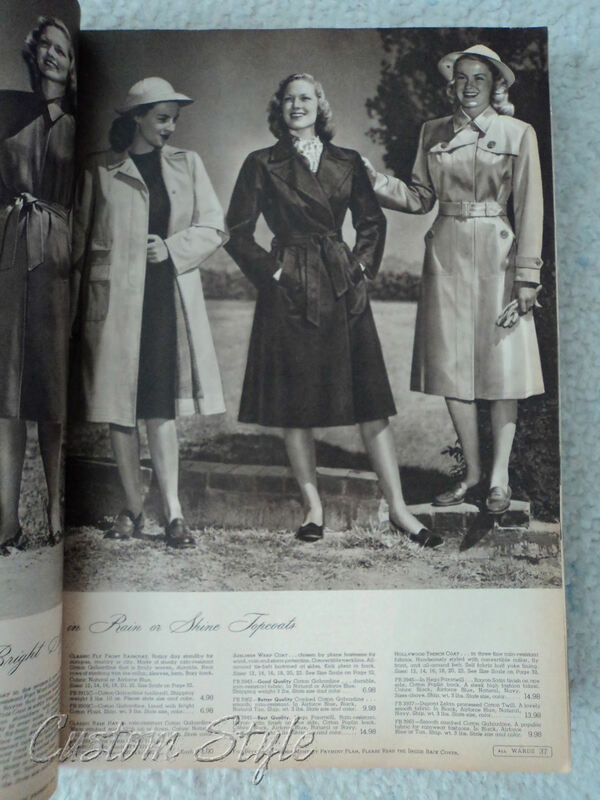 Rain hats and trench coats! And look! 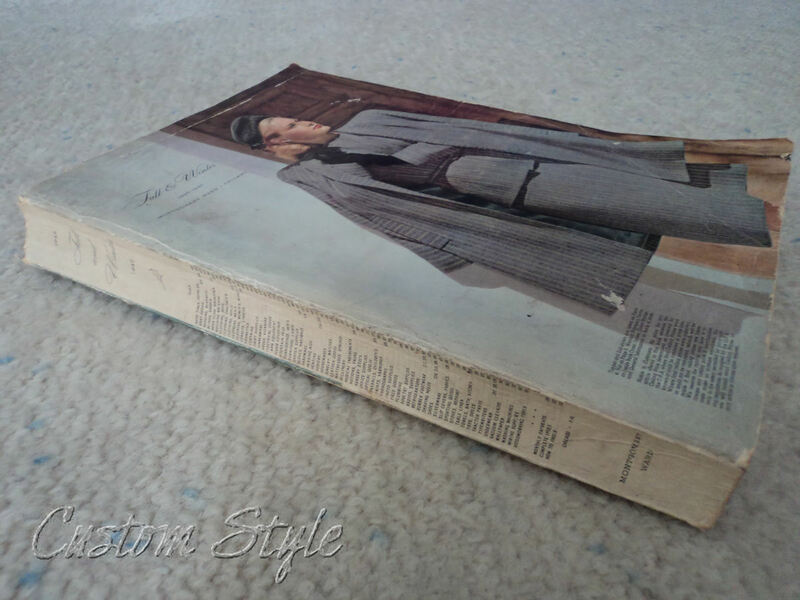 Tying the belt of your coat isn’t such a new idea even though current fashion magazines act like it is. 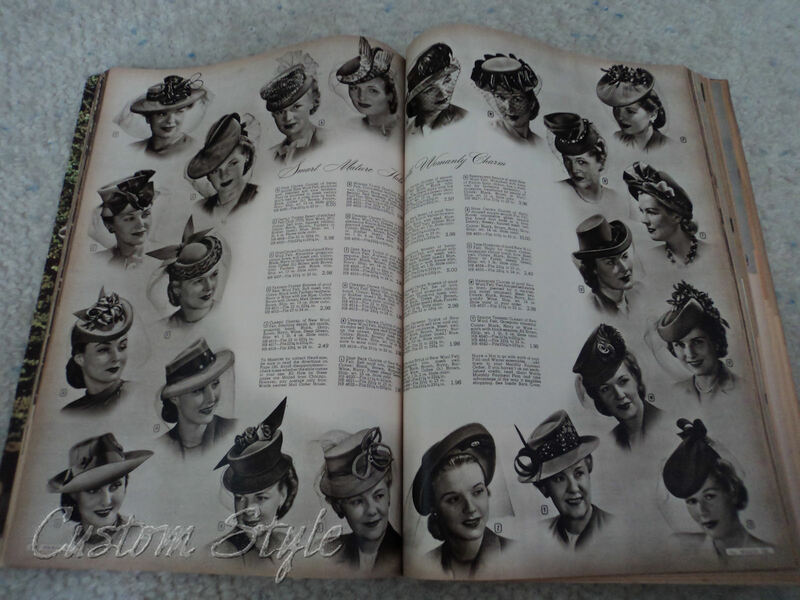 There are pages and pages of beautiful hats! I wish it were easier to pick up millinery supplies at my local fabric stores – I may have to make some of these! I would totally wear the two in the bottom right corner! Love the colors! 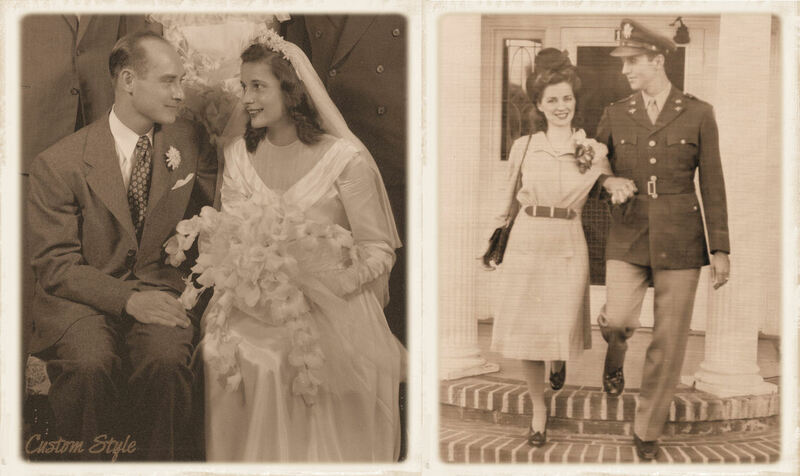 I love digging through the piles of old photographs that my parents have of their parents during the Forties. My grandmothers, when they were young women, both lived in opposite parts of the country but both radiate the beauty of that decade. Something about the journalistic style of photography of that period, coupled with the way they dressed, makes me wish I could go back to visit the past for a couple of days just to meet the women in those pictures – or maybe I just want to see the scenes in color with my own eyes. The quiet elegance of 1940s fashion has been immortalized in Hollywood classics like Casablanca and It’s A Wonderful Life, and more recently in modern movies like Pearl Harbor and Captain America: The First Avenger. 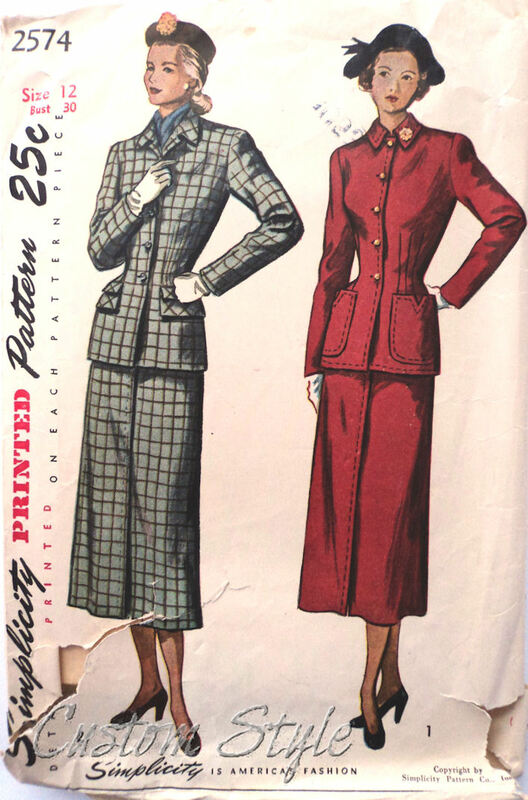 World War II influenced women’s fashion with military style-lines and the practicality of slacks and work clothes needed for factory work. Yet, somehow, the wartime women still managed to hang on to their femininity – becoming the iconic ideal of what today is still considered a timeless look in the fashion world. One of my best friends, Marlene Whiton, is a makeup artist in the film & television industry. This past Saturday, there was a continuing education class for the local hair & makeup artists like her, who need to renew their licenses. 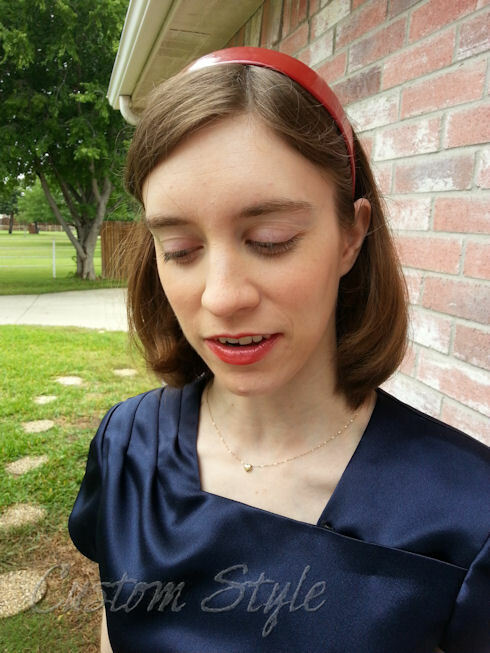 The theme was “1940s Glamour Girls” and she recruited me to be the model they needed for demonstration purposes. I was thrilled – I love period looks! 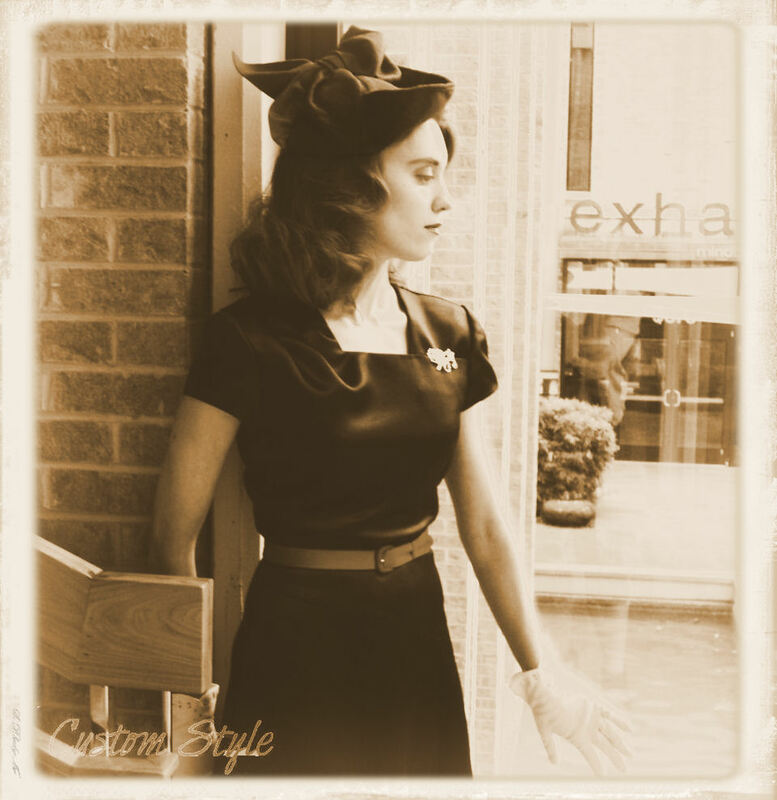 Of course, as a costumer, I couldn’t resist making myself a complete ’40s style outfit – not only a dress, but a hat too. 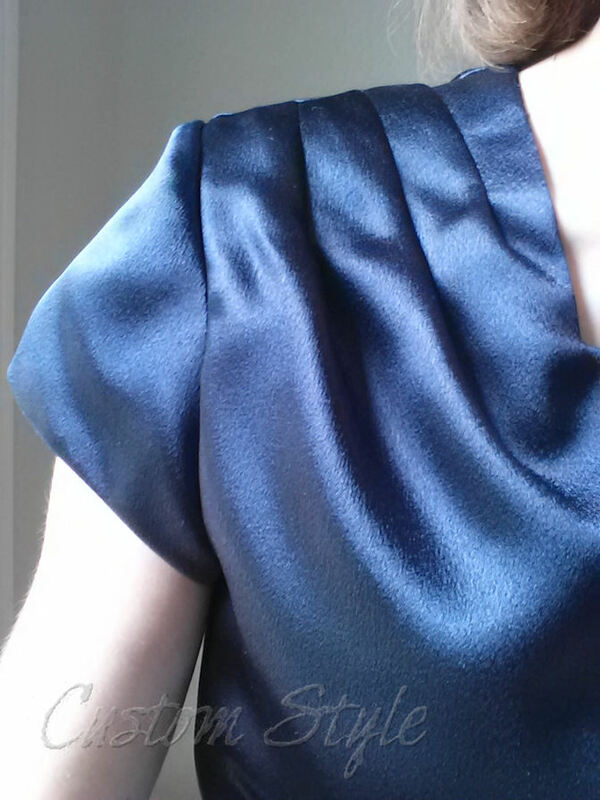 I had just enough left-over navy crepe back satin from a previous project for my dress. 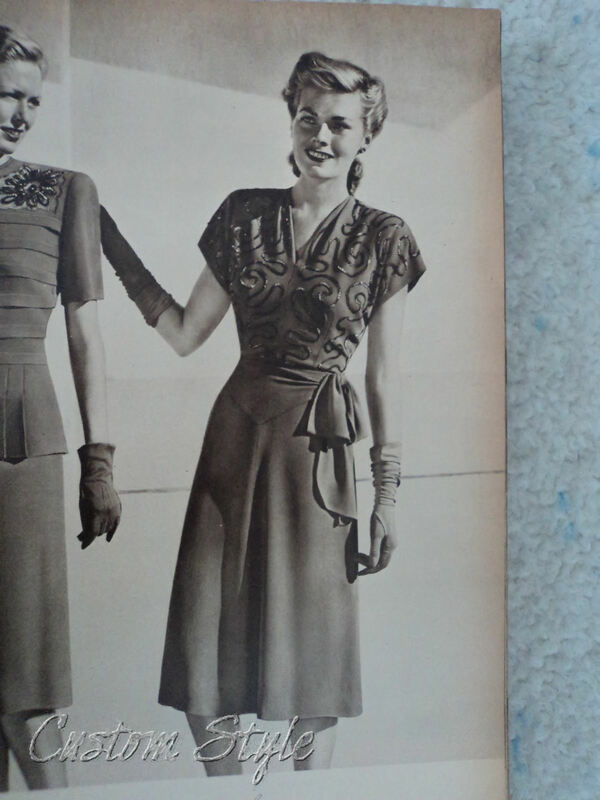 During the decade of World War II, a patriotic color-scheme of red, white & blue was very popular in women’s fashion. So I made a red felt hat and a red fabric belt to go with some red heels I already owned because matching accessories was very important to the women of that time. I completed the look with a pair of my mom’s mother’s ivory gloves and rhinestone brooch.